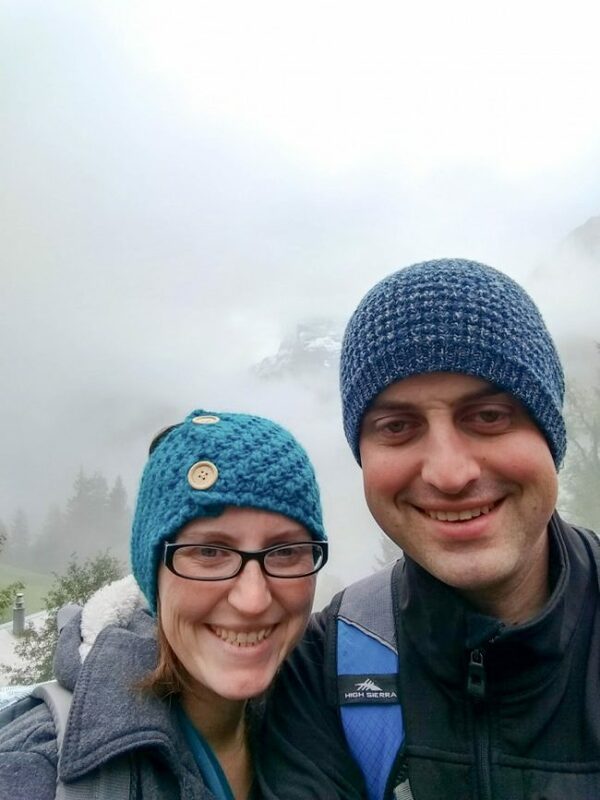 The most amazing two days of our trip were spent in Murren and down in the Lauterbrunnen valley in Switzerland. It is the most beautiful place in the world. The day before’s adventures included exploring Strasbourg and Colmar, France. Now, it was just a short drive to Lauterbrunnen and a cable car and train ride to our final destination. First thing in the morning we were up and on the road, excited to make our way into Switzerland that day! It was a short 2.5 hour drive into Lauterbrunnen which is a city nestled at the feet of the Swiss Alps. From there, we parked our car in the easy to access car park located right at the train station. It was very easy to access and we were able to quickly figure out the transport options. Murren is a car-free town so the best way into the town is by Cable Car up the side of the mountain and then a train across the top until you reach the town of Murren. 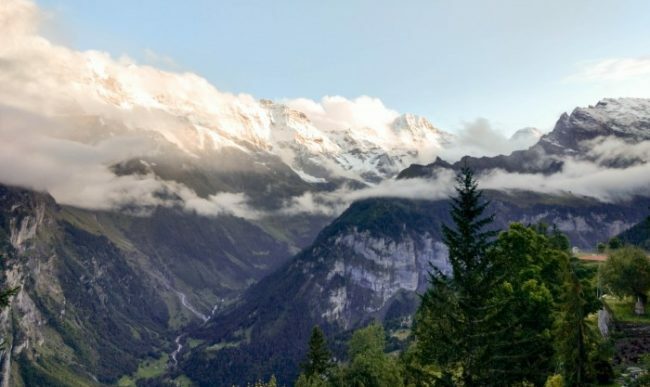 There are several other cities up at the top of the Alps, any of them would be amazing to stay in, but we loved Murren because it was small, quiet, and has the most incredible views! We were awe struck as we walked around the really cool town of Murren. We felt like we were in the clouds as we first arrived and it was foggy everywhere. 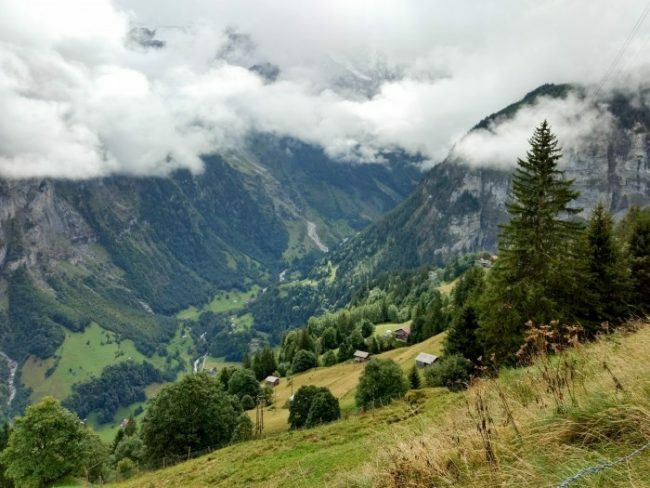 We had read a travel guide that recommended biking down from the town of Murren back down to Lauterbrunnen in the valley. In this picture you can kind of get a feel for high up this town sits. We as at a bike shop and they said they wouldn’t recommend it, that the trails are very steep for biking and would be a difficult trip. Somehow, we took that to mean okay – well let’s walk it instead! Let’s just say, a few hours later our calves were screaming at us (and the next few days, too). The walk down was really very incredible and if you’re a frequent hiker you might fare better than we did – but I wouldn’t recommend it otherwise! We did get to see some of the beautiful countryside most tourists don’t get to see, like this waterfall we passed along the route. A short ways from Murren is another small town that was the first thing we came across on our hike down. We stopped in, got some lunch – they only offered two options on the menu – and both were delicious. That hike alone would have been a fun detour, but the whole path, while incredible to walk through, was just too much for us physically. 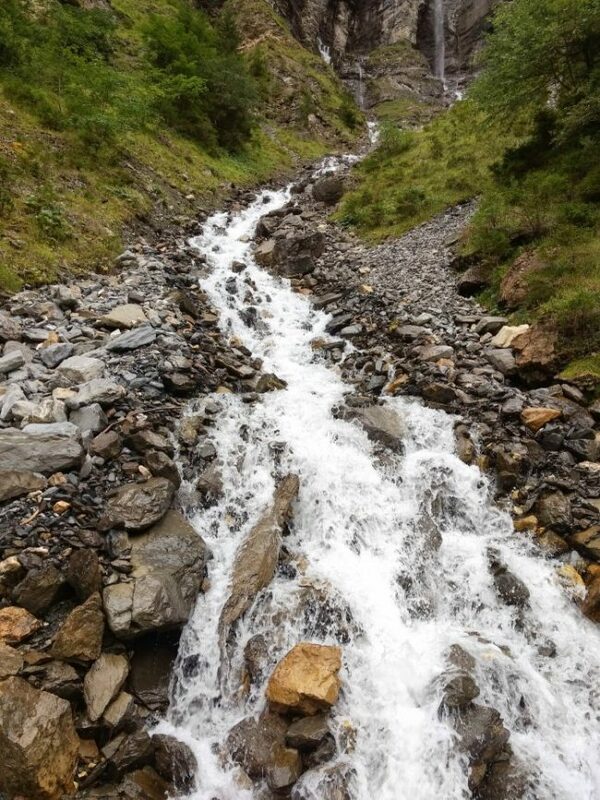 When we reached the bottom of the trail and ended up back at the feet of the Alps we had just hiked down from and then walked across the valley to Trummelbach falls. The falls were absolutely incredible. 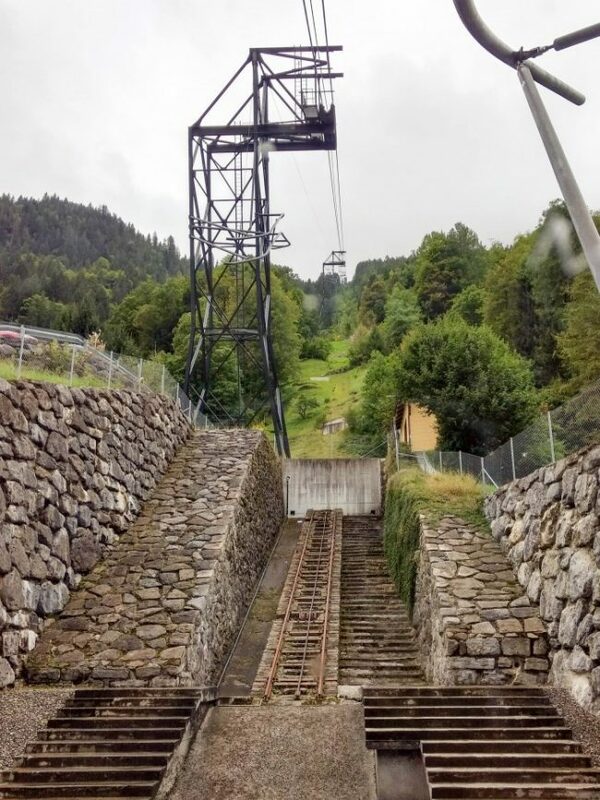 They wind back and forth inside the center of the mountain as the main outlet for the melting snow off the Alps. It’s loud inside the mountain with the falls roaring, but so incredibly cool. It’s is the closest I’ve ever been to a waterfall of this size. An elevator can take you up to the main views of the interior falls, but there are some additional stairs to climb for even more views of the winding falls. 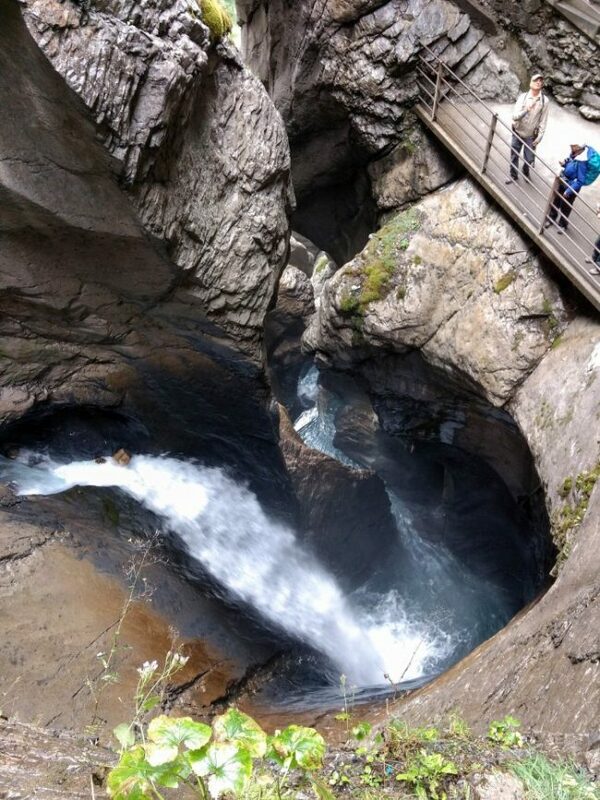 Trummelbach Falls are the coolest falls I’ve ever seen! After a day of hiking and exploring the small towns along our route it was time to head back up to Murren where we would be staying for the evening. We checked back in, warmed up with a hot bath, and then headed to the hotel restaurant for an incredible dinner. Our waiter recommended their Rosti a authentic Swiss dish of hashbrowns, ham, raclette cheese, and a fried egg. It was delicious – a must try! While dining, we had these amazing views of the alps. I can understand why people would choose to live in a place like Murren. It was quiet and peaceful and the views are absolutely breathtaking. I’m anxious to head back to Switzerland as soon as I can! 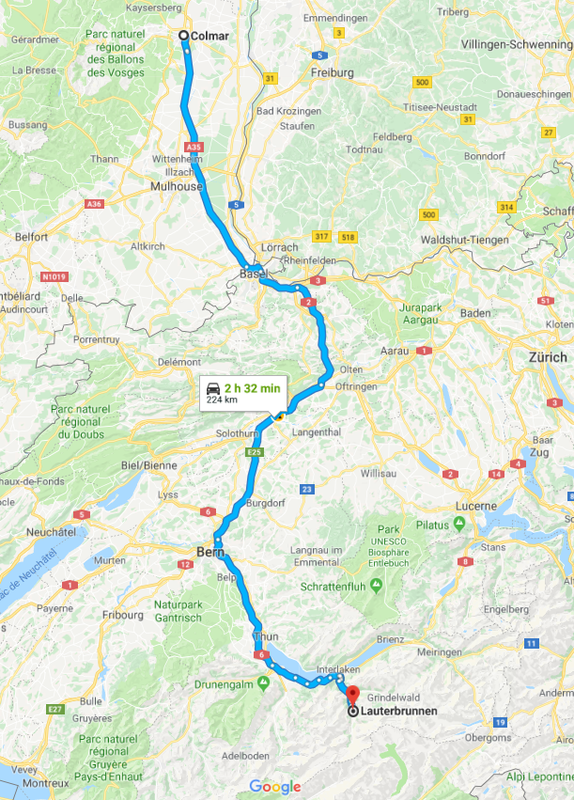 The next day’s journey was a once-in-a-lifetime trip to the Top of Europe: Jungfrau and then Bern, Switzerland. Wow thank you for sharing your experiences. Amazing photos, not quite like being there myself but I can feel like I am through those pictures. Wow Switzerland is beautiful! A car free town, sounds lovely. 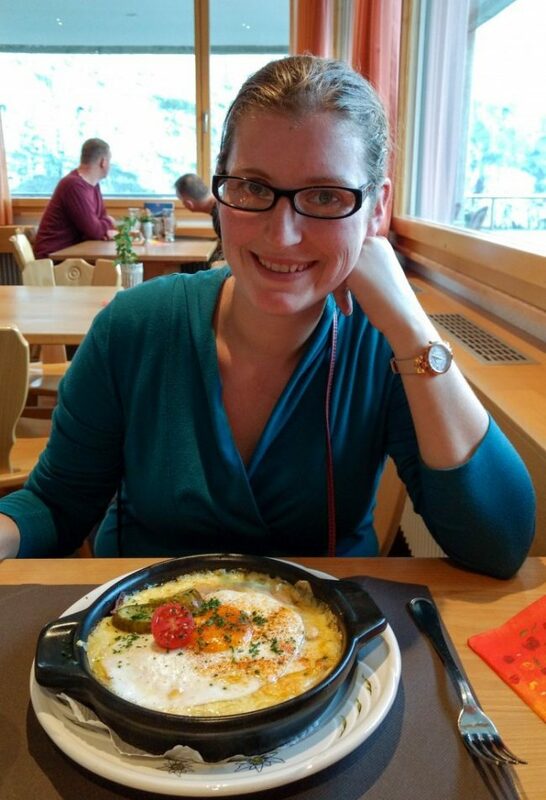 That swiss dish looks heavenly too. I’d love to go. Switzerland is definitely on my bucket list. I would love to visit one day – it is truly beautiful! Wow! I would love to see the beautiful Alps in person one day too! What an amazing experience! This is a beautiful road trip! It makes me want to pack up and go to Europe. I’ve never been away from the East coast USA, so that’d be something to experience. Love this!